Metal Textiles knitted wire mesh high temperature seal gaskets provide resiliency, strength in compression, and a nearly unlimited choice of materials, geometries, or sizes for specific applications. Most importantly, they provide superior performance in hostile environments such as high temperature seal gaskets, cryogenic or caustic environment applications where other materials would fail as a result of decomposition or deformation. When knitted mesh is combined with other materials, the mesh serves as a “backbone” support imparting resiliency and strength in compression to the subsequent composite seal. Because of the wide array of materials available for construction, knitted wire mesh can also be used to create any number of flexible, resilient gaskets or seal configurations over a broad range of operating conditions. Depending on the specific application, knitted wire can be fabricated from almost any material or combination of materials that can be drawn into wire or filament form. For extreme environments, the most frequently used material is stainless steel wire. But other ductile metals, such as aluminum, copper , Inconel, Monel, Titanium, Hastelloy, and other exotic alloys can also be used-as well as synthetic fibers, polymers and yarns-as either single substrates or configurations of multiple materials. This wide range of material options permits flexibility in producing gaskets that can be expressly designed for specific critical applications. Metal Textiles has also developed a family of seals which combine knitted wire mesh technology with a variety of other materials to form unique composites. The resulting composite seals exhibit characteristics which can be useful in extremely harsh, chemical-process system environments. 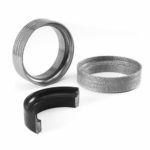 These seals are generally die-formed to fit specific applications within allowable tolerances. Available composite materials include graphites, ceramics, and other similarly performing fillers. Exhaust systems for gasoline, diesel, and gas turbine engines are subjected to temperature extremes, corrosion, vibration, and thermal shock. Most of the negative effects of these conditions occur at the seals. Conventional seals simply cannot meet these criteria. In conjunction with leading automotive manufacturers, Metal Textiles has developed knitted wire mesh static and dynamic low-leakage exhaust seals that exceed them. High temperature seal gaskets for furnaces, ovens, and boilers are tubular or flat constructions of knitted wire mesh and refractory materials. Generally, the mesh is knitted with metals or alloys and then covered with fiberglass or a similar material. Metal Textiles knitted wire gasket constructions are obtainable in any desired length or as preformed gaskets, and withstand direct exposure to flame, combustion products, superheated steam, petrochemicals, rapid temperature changes such as those occurring during start-up, and the oscillatory pressures generated by the combustion process. 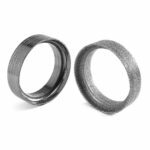 Unlike other gaskets, knitted wire gaskets need not be replaced when removed but can be reused indefinitely, providing additional savings in maintenance costs. Furnace, boiler, and oven doors that must be opened and closed frequently impose intense demands on gasket materials. 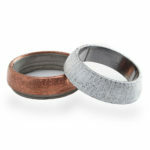 The gasket must compress readily to seal the joint—yet retain its resiliency and integrity under prolonged, repeated use. Knitted wire has been field documented in controlled tests that exceeded 50,000 openings and closings without failure. The unique properties of knitted wire provide a sophisticated yet simple solution to the problem encountered in sealing open-bottom foundry molds used in casting iron. The molds stand upright on the casting stool, requiring a seal for the spaces between the mold and the stool in order to chill the molten metal to prevent costly leakage. Metal Textiles knitted wire formed into a multi-core cable solves this problem. 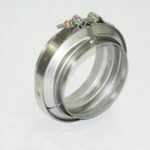 Consisting of five plain or galvanized steel wire-mesh tubes bound together by a single knitted wire sleeve, the gasket is compressed between the mold and the stool, filling all gaps around the joint. 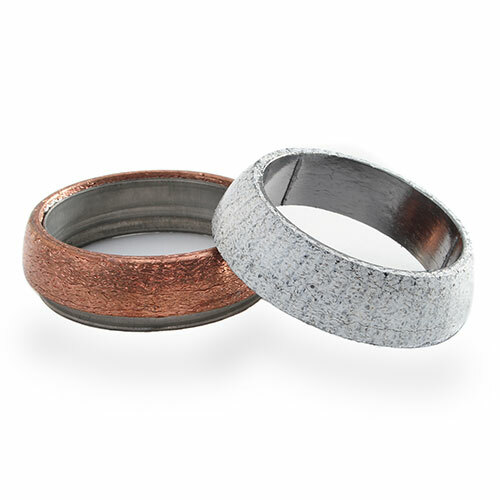 The poured metal flashes into the gasket, where it cools, forming a slag skin, thereby minimizing leakage, waste, and safety hazards. Cold can often be more stressful on gasket materials than extreme heat, since the molecular structure of many materials is affected by cold conditions. Ordinary gasketing materials become rigid, hard, and brittle—and may crack, crumble, or even shatter on contact with liquefied air or gases. Metal Textiles high temperature seal gaskets technology provides a solution to this problem. 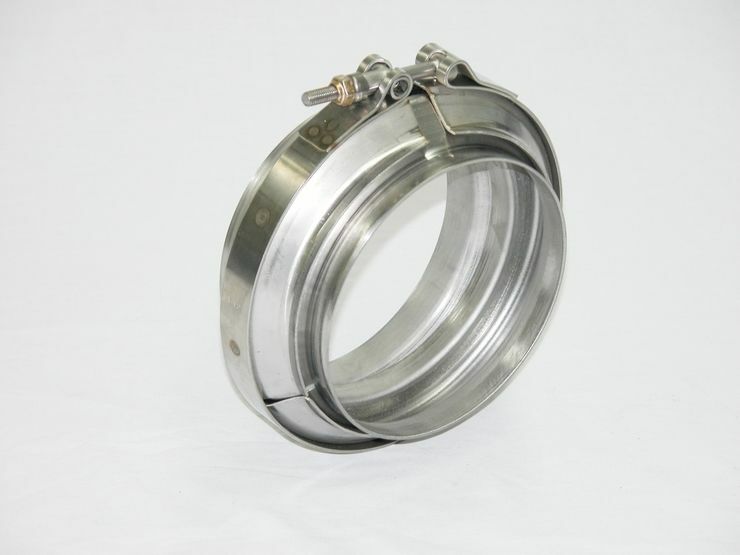 This design withstands the destructive effects of cryogenic temperatures, creating a perfect seal yet maintaining resiliency under the most severe conditions.